The knee-jerk reaction at the opening moments of the trailer for Jen McGowan's Rust Creek is a groan; here's yet another movie about a woman who gets stranded in the backcountry only to be found by a couple of locals who turn out to be killers. Thankfully, this is not that movie. Hermione Corfield leads the movie as Sawyer, a savvy young woman on her way to a job interview. A wrong turn and car trouble leaves her stranded in the Kentucky forest where she is chased by a pair of locals looking to have a good time; whether she's interested or not. She fights back, a chase ensues and Sawyer then finds herself at the mercy of another local named Hollister (Micah Hauptman). 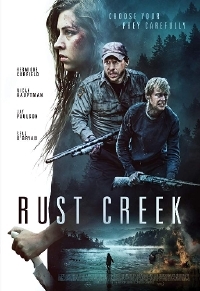 I like that Rust Creek seems to be actively playing against expectations of the subgenre and I'm hopeful that the female creatives - in addition to McGowan, the movie is co-written by Julie Lipson with cinematography from Michelle Lawler - means this will have a slightly different eye to a familiar trope. Rust Creek opens in theatres and will be available on VOD January 4.